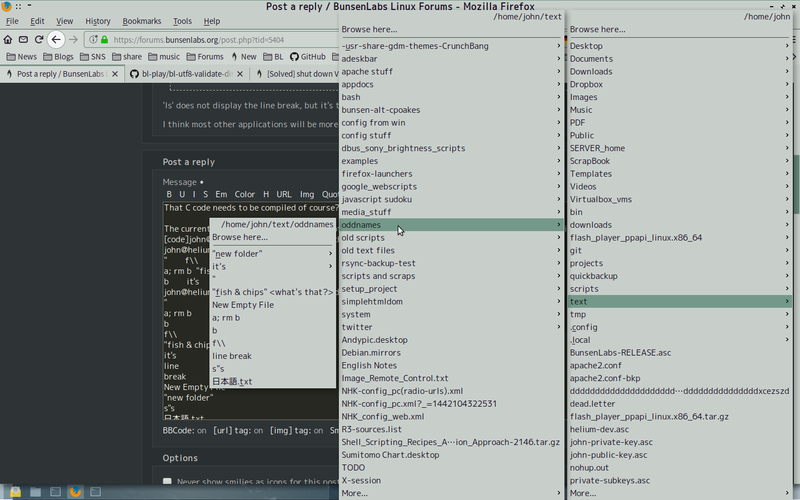 » Bl-places pipemenu issues "solve"
I copy on github the text of the pipemenu and change it in my computer but the issue is still there. If somebody can explain me what to do it will great. Re: Bl-places pipemenu issues "solve"
Have you made any changes to your system, configs, upgrades etc? Did you put a dash between places and pipemenu? ^ Is that the full output of the command? The beginning is missing. It might be struggling to handle one of your files. Have you got anything unusual in your $HOME directory? For example anything from Windows or anything Unicode. What’s the file before default_dual.wav? Is ‘ezszd’ a clue (might be mangled). I was having a strange unicode file with a very long name in my home , i just deleted it and now all is good. Hi wagmic, glad to hear the issue went away! Could you possibly post here the long unicode filename that broke the menu? I'd like to see if the script can be tweaked to handle it. So just a long line of d's, no funny unicode characters? I'll give it a try - maybe there's a string length limit somewhere. On topic, most likely really long filenames or paths could cause this, even if composed of standard characters. So I can believe there's some sort of length limit. I created a file with that name and the "places" pipemenu works OK with it. So it's not the length. There may well be some characters hidden and not displayed that could been causing the havoc. Should be a way to display any hidden characters though. May we assume that the file came from Windows? How did you move it across. Was it in a zip file which you then unzipped on Linux? On Linux, filenames should just be a NUL-terminated series of bytes. UTF-8 works with this, as it doesn't contain NUL-bytes (except at the end). Unicode sometimes contains NUL-bytes which is why it creates problems. Have you still got the file? What do you get from the following command? Not sure if 'file' only checks the contents rather than the filename though. @johnraff - how do you feel? Is it an edgecase we want to handle? I suspect that checking files individually would be rather expensive. Ideally we'd want something that checks a whole directory for Unicode filenames, but not sure if that exists, nor would I know how to write one. @malm UTF8 names should work right? The script is supposed to accept any UNIX filename, so as you say names containing nul-bytes are no good. I didn't know such names were even possible! Let's have a think about it - and a bit of web-searching. Maybe there is a lightweight utility that can check the directory before going over the files individually. If it's too hard we could maybe consider ignoring the issue. ^^On second thoughts, it seems to me that any Linux app is likely to choke on non-Unix filenames, so I don't think there's much point in putting effort into letting our places menu handle them. ^^ Yes, UTF-8 will work. We could consider at least 'gracefully surviving' other encodings. As I'm sure many know, Linux treats filenames as a sequence of bytes, terminated by a NUL-byte. The file system is agnostic to encondings, leaving the handling of these to user applications. One of the reasons for choosing UTF-8 as the encoding for Unicode characters on Linux, was the backward compatibility and absence of NUL-bytes. The problem isn't just NUL-bytes though. Depending on the extent to which applications 'validate', issues could be experienced with control characters and other things. I had a quick play with the filename converter tool 'convmv'. When converting to UTF-16LE (which contains NUL-bytes), convmv complains that the filename contains characters that do not conform to POSIX filesystem requirements. I'm sure that warning refers to NUL-bytes, because other encodings work fine. It is fast and could easily be incorporated into the bl-places-pipemenu script if you fancy it. Ready! I converted 1 files in 0 seconds. I'm not bothered though if you want to leave it (possibly in the interest of avoiding complexity). I enjoyed having a play with encoding/decoding. That C code needs to be compiled of course? The current places menu handles all kinds of filenames: quotation marks, line breaks... I think anything UNIX. , but it's there, as the second command shows. I think most other applications will be more restrictive than this. off-topic: @Malm I found some of the directories in ~/text made the JGMenu openbox menu emulation crash. (The native OB menu is OK.) When I've got a bit more data I'll open a GitHub issue.